On How it was Awesome to be in That Guy's Group. Jon agreed to go to a parenting class with me for 14 weeks during the second hour of church. He did it mainly to get out of listening to the sermon. Not that he doesn’t like them. It’s just that he doesn’t like to talk, or listen to anyone else talk, until about 1PM every single day. Mornings just aren’t his jam. Despite the fact that it began 2 hours before he officially wakes up, we loved that class. One week, the guy in the video told us that when our kids become teenagers, it is very likely that they will be incredibly insecure. Which means that as they begin to venture out into the world more and more on their own, they will wonder who they really are. They will feel vulnerable and anxious about every single thing and possibly run away to join a hippie commune in Oregon. He also said we probably all remembered feeling the same way when were their age. When the video was over, we split into groups. One of the guys at our table clearly had something to say. You could tell by his face that he couldn’t wait to talk. I was relieved. We weren’t going to have any of this “well, should we start with the first question?” followed by awkward silence nonsense. We were jumping into the deep end without even feeling the water. I looked around at the other groups and knew they wished they were us. They wished they had that guy. In my head I said, “Sorry, Suckers,” and turned to hear what he had to say. Then he described his teen years for us. He had grown up on a farm, and he spent every day working with his dad. He was the oldest and the other 2 sons were more “bookish,” but he loved to work with his hands. So his dad entrusted him with the operation of the farm. He learned to use the equipment and was driving the tractor on errands when he was 14. His face lit up as he described what it was like to be his dad’s right-hand man. He knew who he was. In the family, the town, the world. He was a Layne. There was an identity that went with the name. I am a Layne and this is what we do. He was dependable and capable, so his dad conferred on him some of the responsibilities that provided for his family. They had worked the same land for generations. He could look at the ground and know that his grandfather and great-grandfather had lived and worked in the same soil. That does something good to a person. I kept glancing over at Jon, knowing that he was glad I made him get up early. This was exactly what we’ve been thinking lately with our own family. I shouldn’t say exactly. Not the farm part. We would totally starve. But we had started thinking we should try to work together. And not just work together pulling weeds in the yard or doing the household chores. ‘Work together’ as in create a family business. With our kids. Here’s the thing. We aren’t those people that can handle having a lot going on. Jon and I both are easily overwhelmed. Maybe it all comes down to a desire to simplify our lives. To pay the bills by doing something that we already do anyway. All four of us love stories and love to draw. Jon has the ability to take our words and drawings and make them into an interactive story. And he is teaching us how to do it, too. It is our hope that our kids will grow up knowing what it means to be an Alexander. We hope that along with knowing that they are beloved, talented, “fearfully and wonderfully made”, they will think of themselves as capable creatives. We are trying to instill that identity in them by involving them in the process by which their ideas (the good ones anyway), through hard work and discipline, are turned into something awesome. Something that people may even want to pay for. 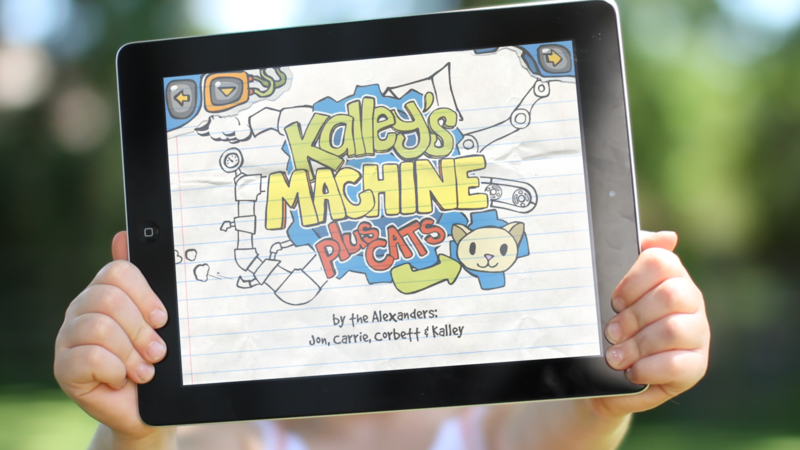 That’s what we have tried to do with Kalley’s Machine, (our first interactive story). We still don’t know if anyone will buy it. This whole thing is still in the “experiment” phase. We are operating under the theory that children who grow up knowing that they play a vital role in their family will go out into the world knowing that they will also be immensely significant there – kind of like what the guy in our class said. He wasn’t insecure out in the world, because he had learned at home that he was important. That guy’s dad taught him to drive a combine when he was 9 years-old. We don’t have a combine, but Jon scooted over in his computer chair so our 6 and 7 year-olds could climb up and learn how to draw in Adobe Ideas. Recently, I asked Corbett to do some concept sketches of a character for our next app, and she gave it to me all separated – the body of the person separated from the limbs. Exactly what you do if you’ve learned to animate with different layers. Jon was thrilled. One time, the girls sat us down in the kitchen and told us to watch a play that they had made up. We did, and it was terrible. We told them how awful it was and why it was so boring. We didn’t even care one bit about their main character, and they had introduced way too many side plots. We assured them that no one would ever, in a million zillion years want to see that play, and then we got out our giant whiteboard. Together we drew out a storyboard for a really good play, with a main character that we all cared about. And we had a blast. This is our family’s version of plowing a field together. Feeding chickens. Whatever the heck else you do on a farm. I just want to do whatever I can to avoid that hippie commune in Oregon. Actually, I don’t think the video guy ever said exactly that. I think I made that part up in my head. The one other thing that wasn’t exactly true about what I just wrote now was the part about how I looked around at all the other people in the class, the ones that weren’t in our group, and called them ‘Suckers’. Nobody does that, who would do that? In a class?! At church?! No way. I absolutely did not do that. I just kind of wish I had.